It’s important to know the more common symptoms of stress so you can identify them in yourself or someone you care about. Being able to identify symptoms such as fatigue, sleep problems, upset stomach, angry outbursts, muscle tension, headaches, and sadness, to name a few, is helpful. You can then begin to manage your stress (or have a talk with your loved one to determine what’s wrong). Our chart, above, divides stress into 3 levels, starting with minor stress at Level 1, and severe stress at Level 3. Essential oils for each particular type of stress are identified, along with blends you can make yourself. 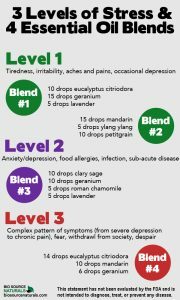 * Use any of these oils alone, or in one of the recommended blends. Use these blends (or any individual oils) in a diffuser or your bath. If using the blends or individual oils for a massage, be sure to mix them with a carrier oil as your base. See below for a repeat of what is summarized in the chart. 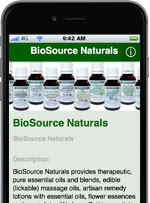 Go here to learn more about how essential oils help calm stress and fear.